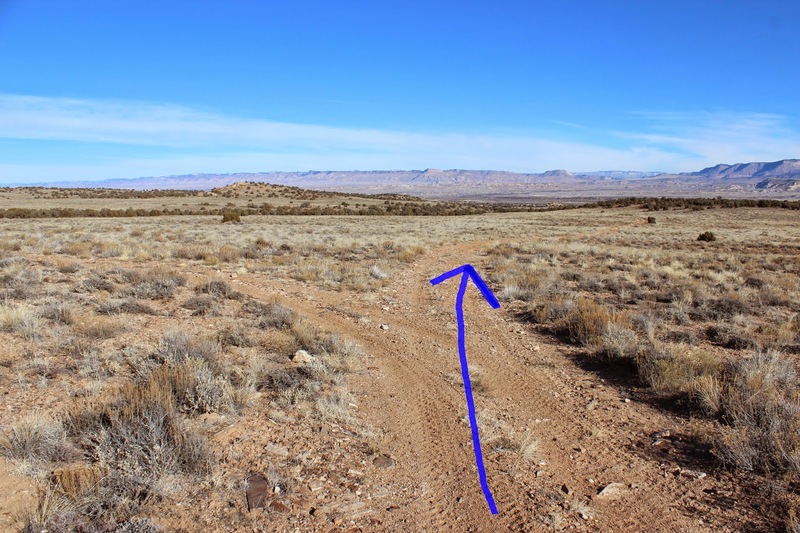 Jack's Trail is the name we are giving to a multi-use trail in the Bean Ranch Area of the Dominguez-Escalante National Conservation Area south of Grand Junction, Colorado. 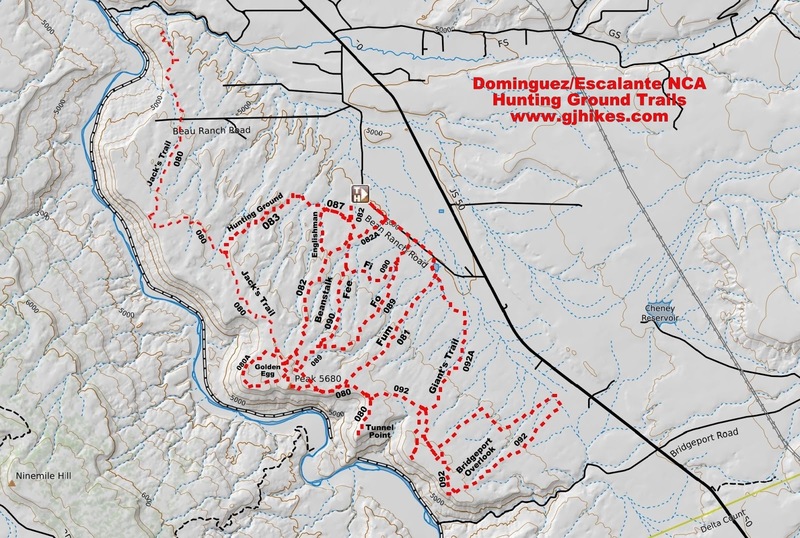 The Bean Ranch Area has numerous interconnecting roads that we have mapped out and assigned names of our own choosing since they are known by no name of their own. At first we began calling the road that leads to the top of the mountain the 'Beanstalk' since we were in the Bean Ranch Area. Later we continued naming the other trails after the 'Jack and the Beanstalk' theme. 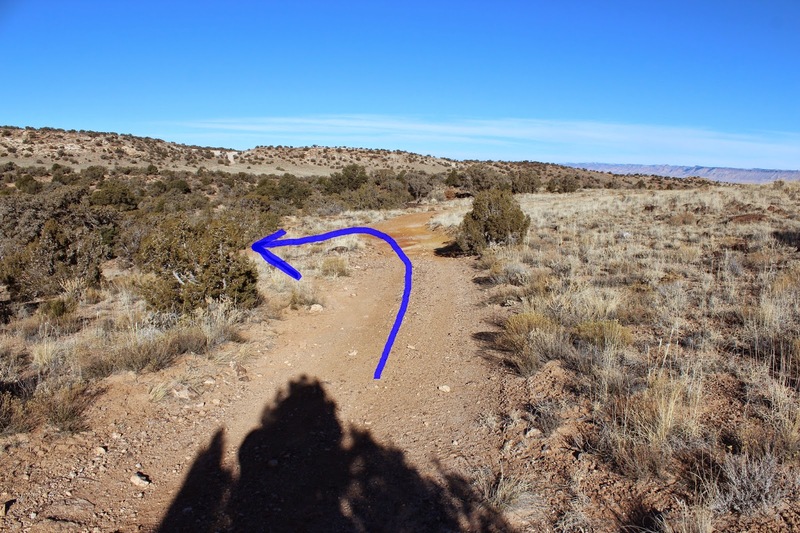 This particular trail begins at the top of the Beanstalk and continues north, making contact with the rim overlooking the Gunnison River in several place where the views are quite pleasing, and eventually ending at a private property line just before reaching Kannah Creek. To get to the trailhead drive about 4.5 miles south of Whitewater on Highway 50 and turn right onto the Bean Ranch Road. Follow the Bean Ranch Road over the hill. 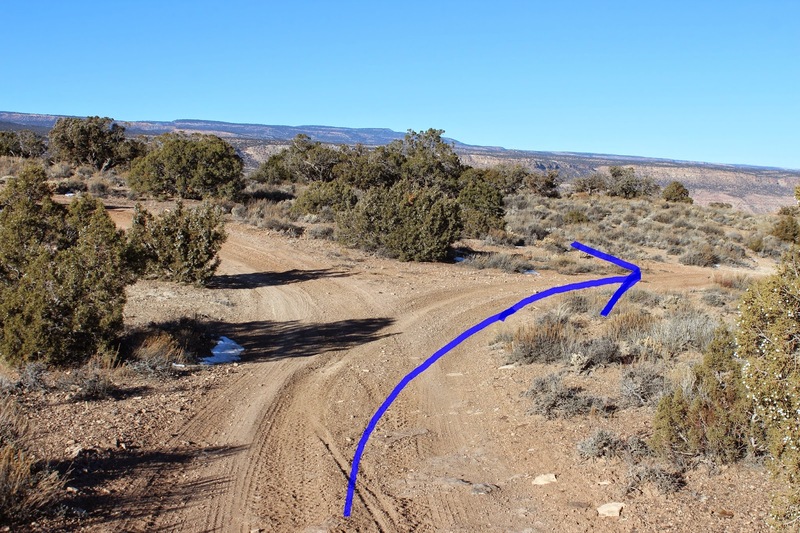 The pavement ends after 1.3 miles and the boundary to the Dominguez-Escalante National Conservation Area comes up after another half mile. There is ample room for parking on the righthand side of the road after crossing the cattleguard. Follow the directions in the Beanstalk post to the top of the mountain and take the road on the right. The trail heads north following the line of the ridge with only minor changes in elevation for the first mile or two. Eventually it begins dipping in and out of a few small valleys but never encountering anything that is all that steep. At the 4.33 mile point, measuring from the trailhead, watch for a fork that you will want to take to the left. 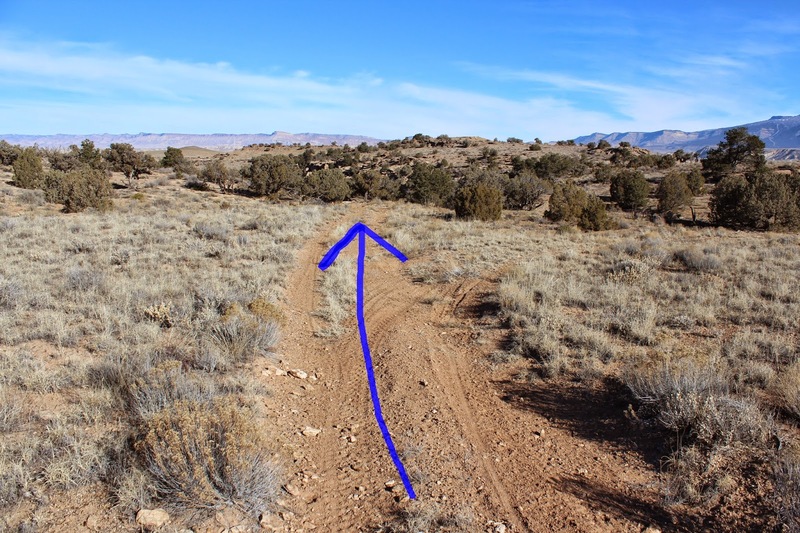 The right branch marks the beginning of the Hunting Ground trail that heads back down the mountain going east where it ends at the Bean Ranch Road. The trail dips into another wash and as it continues north it climbs the only real hill of any consequence. At the top of the hill the route progresses in a more casual manner. The scent of sagebrush and juniper trees add to the trails enjoyment. We don't have allergies but if we did it wouldn't matter much seeing how we made this ride in January. Another fork comes up just past an old well site. Both forks lead to the same point but the right fork is the shorter of the two routes. On the other hand the left fork leads to another nice overlook. The trail begins losing elevation as it bends to the northeast across large open expanses of sage and other brush. Stay to the right at the 6.06 mile point. The left fork comes to a dead end at another overlook. We will return at a later date and ride that trail. The last fork comes up at the 7.89 mile point. From here the trail continues along the left fork. 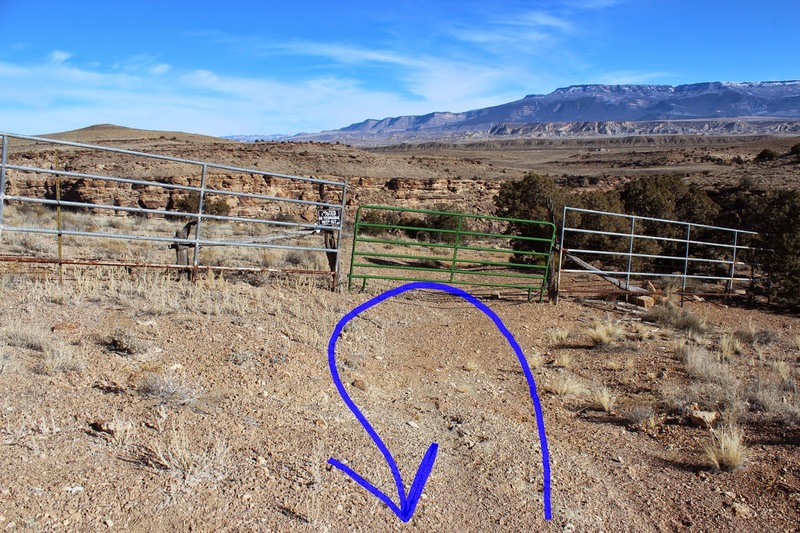 We entertained the idea of taking the right fork, which we did for about 50 yards or so, to see if we could find a route back to the Bean Ranch Road that didn't cross private property but that too will have to wait for another time. The trail comes to an end at a locked gate 8.43 miles from the trailhead. It is a little sad to come so close to reaching Kannah Creek just to be turned around just as it is coming into view. When we set out on this ride we were hoping to reach the Kannah Creek Road and follow it back to Bean Ranch making one big grand loop. As it is though the ride back along the original route is much more scenic and with a round trip distance of 16 1/2 miles it is one heck of a workout on a mountain bike. At present most of the users of Jack's Trail are on ATV's, dirtbikes or driving a 4x4 but it is also a great place for hiking and mountain biking. If you would like to see it for yourself then all you have to do is grab your favorite toy or 'Take a hike'.